Kick offs: 14:30 BST and 16:45 BST. Coverage: Blues v Ospreys live on Scrum V Live on BBC Two Wales, BBC Radio Wales, BBC Radio Cymru, online, mobile, the BBC Sport app and Connected TV. Dragons v Scarlets live on S4C, BBC Radio Wales, BBC Radio Cymru, online, mobile, the BBC Sport app and Connected TV. Live text commentary on both matches on BBC Sport website. Scarlets players should not lack motivation for Saturday's Pro 12 meeting with the Newport Gwent Dragons, according to head coach Wayne Pivac. Seventh-placed Scarlets need to finish sixth to guarantee a place in next season's European Champions Cup. 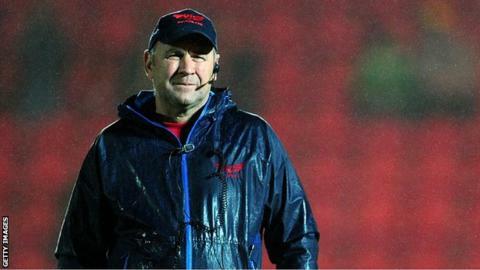 Pivac says the Millennium Stadium clash will be a chance for players to impress Wales coach Warren Gatland. "We're battling for a place in Europe next year and from a team perspective it's the big carrot," he said. "And there's obviously individuals who are playing for World Cup places with Warren Gatland talking in the media about the importance of these fixtures. "So if that doesn't motivate the players, I don't know what will." Gatland has said performances in the double-header Judgement Day event which also sees Cardiff Blues face Ospreys could influence his squad for the 2015 World Cup. Pivac's Scarlets are locked in a battle for sixth place in the Pro12 table with Edinburgh and Connacht, while Saturday's opponents trail the West Wales region by seven points. A win for the Scarlets would end the Gwent region's slim chances, and give them momentum for their final two games of the season at home to Blues and away to Benetton Treviso. Pivac, who took over at Parc y Scarlets after the departure of Simon Easterby in the summer of 2014, says the incentive of European rugby's top-flight tournament was brought home by watching Toulon's semi-final victory over Leinster. Scarlets lost twice to Toulon in the pool stages of this season's Champions' Cup, and have beaten Leinster in the domestic competition. "We watched Leinster play Toulon and we know that on our day we can compete [with them]," he added. "We played well against Leinster here and got a result, [and] against Toulon we had a great performance out there. "Those were great occasions and special games that this team has played this year and we know that we've got the capability and the ability in the team. "It's really making sure that we've got as close to our top side on the field as often as we can I think and we can compete with anyone."